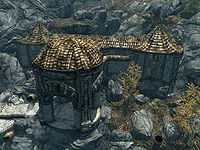 Avanchnzel is a large Dwarven ruin filled with Dwarven automatons of all types. Avanchnzel is located south-southwest of Lake Honrich and northwest of the Orc stronghold of Largashbur in The Rift. Once you obtain the Unfathomable Depths quest the cave entrance will be revealed on your map. As you enter the first room in the cave, you will overhear the conversation among a group of ghosts. This group, consisting of Breya, From-Deepest-Fathoms, Drennen, and Watches-The-Roots, will quickly move further in the cave and disappear. On the left (on the top) there is an iron ore vein. The next room contains a couple of Dwarven Spiders (one worker and one leveled non-worker variant). At the bottom of the room under the light on the right-hand side, a few steps before a steam pipe, is an iron ore vein. Beyond, you will enter a corridor, transitioning you to the proper Dwemer ruins. Beyond the first door, you will walk into a large multi-level room with moving elements (gears and other mechanical parts). You will see another short flashback of the previous party of adventurers (gawking at the location) moving ahead. While you are walking on a suspended bridge, you can spot at the bottom of this room a number of Dwarven Spiders. The bridge forks midway. To your left, the passage rises up to a closed door, beyond which lies a room with a Dwarven Sphere. The room leads to a wide slanted corridor leading both above and below your current position. One Dwarven Spider should be waiting for you at this point, using a table as cover. Following the corridor up you will reach the top-most level in the structure. On one side you can see the large room from whence you came (with the spiders at the bottom), and on the opposite side you will find a door blocked by a wooden beam. Remove the beam and open the door to reach Avanchnzel Balcony. There is an apprentice-locked chest down the right side ramp from the Balcony. Following the same corridor downward, you will reach a door barred from the other side (this will be the quick-exit point once you get through the rest of the ruins), so you have to return to the large room with the suspended bridge and the spiders at the bottom, taking the direction across from the main entrance. As the corridor you enter will snake its way around and above some active machinery, watch for surprise attacks from a couple of Dwarven Spheres. Next, the corridor descends to where you will find a Dwarven Spider patrolling in front of an apprentice-locked gate, beyond which you will find a chest. The corridor will descend some more and twist back towards the main room. You will face more Dwarven Spiders in this section as well as when you get back to the main room, this time at the bottom level. From the bottom of the main room you will see two doors: one close to the south direction, the other close to the east direction. The south door has a master-level trap, and leads to a room with two chests and a few random items, including Dwarven Armor or weapons, and a potion. The east door opens on a downward slope where you will see another flashback from the previous party of adventurers. You can find a chest and the remains of a couple of Dwarven Spheres before reaching the next door, opening onto the Avanchnzel Animoncultory. The corridor into which you enter leads down to a room with more Dwarven machinery, a Dwarven Sphere and a Dwarven Spider. A brief appearance of the previous adventurers (complaining of their lack of lockpicking skills) will point to an adept-locked side gate. Within you will find a chest, a few iron ingots, and some garnets. Beyond this gate you will climb some stairs and continue down a wide corridor, where one locked chest can be found in a side alcove. Shortly thereafter you will climb down a set of stairs and find the remnants of an encampment. You will be greeted by a flashback of the previous party deciding to camp here due to the unexpected size of the place. All the bedrolls will be marked as owned. Shortly beyond this point, you will find an apprentice-level trapped door to your right, which leads to a side room with a chest, various Dwarven artifacts, and the remains of a few Dwarven Spiders for your looting, as well as the Restoration skill book Racial Phylogeny. Past this side room you will enter a larger room with two shelves holding the remains of a Dwarven Spider and a Dwarven Sphere. On your left, you will find an alchemy lab and one active Dwarven Spider. There are several gems both on and under the table with the alchemy lab. On the other side of the room, a corridor dives deeper underground, and leads to a door beyond which another room with a shelf holding similar artifacts is found. This room is patrolled by a Dwarven Sphere and a couple of Dwarven Spiders. As you enter this room, you will see an adept-locked door to your right, leading to a side room with some more Dwarven artifacts, as well as a novice-locked chest. Opposite this side room, an apprentice-locked gate leads to a few other items and an unlocked chest. The next room holds another shelf with Dwarven clutter on it. At the bottom of the next corridor, you see another flashback hinting that not all the sleeping guardians are inactive. Another downward slope and another door will lead you to a raised balcony running around a large room. On the floor of the room are several tables with inert Dwarven Centurions, Dwarven Sphere Guardians, and Dwarven Spiders. Once you eliminate the Spiders you can make your way around the balcony and into the room, where you can grab at least two Centurion Dynamo Cores from the inactive automata, as well as plenty of other Dwarven artifacts. There is also an unlocked chest on one of the shelves. The exit from this room is up a set of stairs in the northwestern corner, leading to a passage where you will find Drennen's body. Traveling a few steps beyond will trigger a new flashback from the previous party of adventurers, explaining how Drennen decided to leave the others. There is also an unlocked chest around the same area, and a few more Dwarven artifacts on a table. Finally, the door ahead leads to the Avanchnzel Boilery. The Boilery zone starts with a downward passage, and a flashback from the remaining three adventurers. 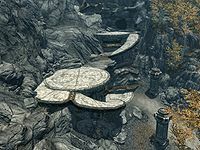 In the corridor beyond, you will walk above a Dwarven Spider that can detect you but won't be able to hit you due to the grate between you and it. On the other hand, there is a Dwarven Sphere around the corner that can certainly attack you. There are two chests and several inert Dwarven spiders on the shelves nearby. Past this guardian, you will find a room where another flashback takes place (during which Breya says "Something doesn't feel right about this") and several Dwarven Metal Ingots between a table and a shelf. The door beyond opens onto a downward corridor with a Spinning Blades trap, which will trigger from stepping on the pressure plates at the top of the corridor, even if you have the Light Foot perk. A series of pipes make passage to the sides of the blade difficult, but it is possible to carefully side-step or run ahead of the blade until you reach the bottom of the corridor, where a lever can be used to turn the mechanism off. The body of Watches-The-Roots can be found next to the disarming lever. The next room contains the Lexicon's receptacle, your goal for the Unfathomable Depths quest. However, you will first have to deal with one leveled Dwarven Centurion that will activate as soon as you are close enough. Another inert Centurion can be found lying to the right of the raised center platform. On the steps of the platform, you will find Breya's corpse. At the top of the stairs is a locked door which requires a key, but it will be automatically unlocked once you place the Lexicon on its receptacle. When you do so, you will also receive the Ancient Knowledge ability. The door at the top of the stairs leads to a room that contains a chest, and a lever-activated elevator that will take you to the door, close to the entrance, that was barred from the other side. Remove the blocking beam, and exit into the first zone of Avanchnzel. The Dwarven spider under the grate in the last section can be killed using the spell Chain Lightning or a damage dealing shout such as Fire Breath. It is also possible to summon an Atronach beneath the grate to deal with the spider. You do not need the quest to be active to gain entry to Avanchnzel. The door is glitched, allowing you to slowly pan across the door until a small gap appears, through which you can activate the bar and raise it, allowing you to open the door. Avanchnzel also appears in ESO. Just after the unreachable Dwarven spider and before the flashback scene there is what appears to be a spike-style entry into the pipe section where the spider is. This entry is non-functional and cannot be opened. Having a follower wait on the grating with the unreachable spider still alive may cause the follower to somehow drop beneath the grating to attack it. If they do, they will be irretrievable. This can be fixed by opening the console, selecting the follower (either by clicking on them or using the prid command with the follower's RefID), then entering moveto player. None of the creatures here are tagged as a boss, which prevents the location from being marked as cleared. To set Avanchnzel as cleared via console, enter SetLocationCleared 18ee5 1. There is an unmineable gold ore vein just off the path leading to the ruin. This page was last modified on 15 November 2017, at 04:26.